The Spear of Leonidas is an ancient artifact of incredible power famously wielded by the king of Sparta at the battle of Thermopylae. The spear is now broken, but is both a deadly weapon and a family heirloom. It was passed down to Kassandra /Alexios so they could discover the truth about their heroic bloodline. Ubicollectibles is delighted to present a unique artefact in the Assassin's Creed series of games: the Broken Spear of Leonidas. 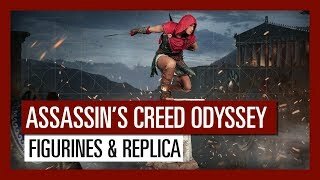 Discover the official reproduction of the relic that will feature in Assassin's Creed Odyssey, used by Kassandra and/or Alexios.